Reactions to last week's visit by the Simon Rattle/Berlin Philharmonic roadshow to London were polarised between the effusive and the vitriolic. So I am providing a few thoughts of my own which, I hope, gravitate more towards the middle way. 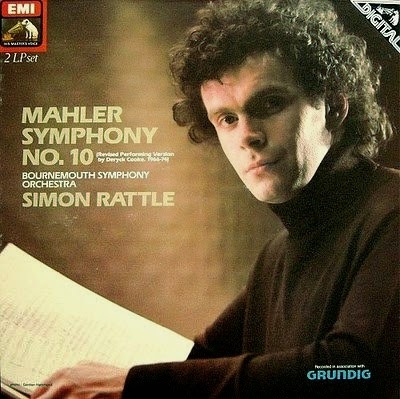 I had some peripheral involvement with Simon Rattle early in his career during my EMI days. One memory is his Royal Festival Hall performance of Deryck Cooke's performing version of Mahler's uncompleted Tenth Symphony. I had arranged for a consumer electronics company to sponsor the recording of the symphony by the Bournemouth Symphony Orchestra conducted by Simon; that is the original 1980 LP release above. The sponsor's sales director, who was not a great classical music fan, attended the RFH concert and I took him backstage afterwards to meet the conductor. Rather lost for words after the explosive performance, the sponsor asked when the orchestra had rehearsed the Mahler. Rattle explained that their last rehearsal was in the hall that morning, to which the sales director imperiously replied: "Ah yes, that was when we were holding our board meeting". Quick as a flash the 24 year old Simon replied "Of course, but your board meeting doesn't have the meter changes that Mahler wrote in that second movement". At that time Simon Rattle struck me an exceptionally personable and hugely talented musician who was at risk from his own ambition and from the ambitions of those close to him, and my opinion remains unchanged today. Classical musicians are, like all of us, human beings and not saints, and hagiographies such as the recent BBC Two TV documentary about him Making of a Maestro do little to make classical music more accessible. In an hour devoted entirely to Simon Rattle, did not his impending departure from Berlin merit at least one mention, yet alone discussion of the reasons behind it? Would not objectivity have been better served by recounting how it was both talent and ambition that took Rattle to Berlin? Would not recounting the following incident have helped audiences really understand the making of a maestro? It is quoted from the official history of the BBC Scottish Symphony Orchestra where Simon was associate conductor from 1983 to 1985. This incident, incidentally, has considerable relevance to his advocacy of a new London concert hall. All too often we hear the lament that classical music is not promoted hard enough. Which is nonsense, classical music is being promoted too hard; in fact it is being promoted to death. The process of beatification which Simon Rattle, Gustavo Dudamel and other musical celebrities are undergoing is doing more harm than good, not least by further straining classical music's already fissile funding model . But it is harmful in another way, because making classical music more human and more accessible is the name of the game, yet turning its highest profile practitioners into demigods makes the art form even less human and less accessible. Providing positive permission for the worship of celebrities also devalues non-celebrity music making; this has a profound impact on the reach of classical music as it brainwashes audiences into believing celebrity is good and amateur bad. The result is that making music is no longer enough, an amateur must make music on a YouTube audition in the hope of becoming a professional celebrity. So the best of luck to the hugely talented Simon Rattle at the London Symphony Orchestra, or wherever else he lands his next gig. But if we were honest and admitted that celebrity conductors are, of necessity, Machiavellian beings with batons of gold but feet of clay, a whole new audience would relate to them. QED. Also on Facebook and Twitter. Any copyrighted material is included as "fair use" for critical analysis only, and will be removed at the request of copyright owner(s). You are completely correct; additionally, it also makes it more difficult for newcomers and less established professionals to receive opportunities critical for improvement of their skillsets, and to sustain a career without descending into penury. The Maestro Myth and the cult of celebrity will be the death of classical music. Also the practise of paying these 'celebrity' conductors (and opera singers)ridiculously large amounts of money takes funds away from everyone else, breeds resentment amongst orchestra members and is bad for music making in general. Views shared by many involved in new music?